I am a huge seafood lover and this is hands-down, my favorite salmon recipe. I had to share! Preheat oven to 350 degrees. In a bowl, whisk together olive oil, lemon zest and lemon juice. Season salmon with salt and pepper. Drizzle tops evenly with lemon mixture, and gently rub over salmon. Bake 15-20 minutes. In a bowl, mix together Greek Yogurt, garlic, dill, honey, and enough milk to reach desired consistency. Season with salt and pepper to taste. Store in refrigerator, about 20 minutes to chill. While the salmon is in the oven and the sauce is chilling, saute kale until bright green. 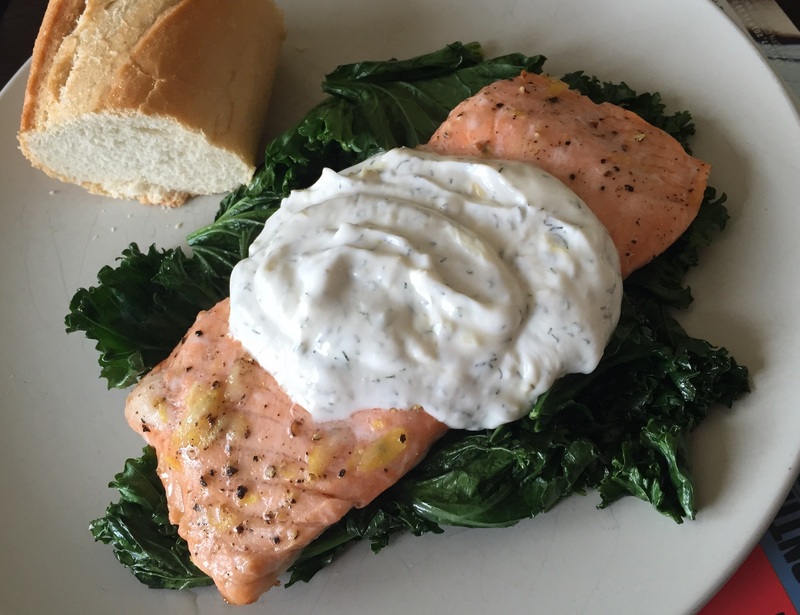 Place salmon over kale and top with creamy dill sauce. Enjoy! I’m Michelle, a 20-something born and raised suburbanite of Chicago. I took the plunge and made the big move to the city in the fall of 2010. Most say I am a poor example of a Chicagoan; I put ketchup on my hotdogs, have never been to the Sears Tower and I hate the cold.